Size (Diameter): 18.4 cm. / 7.2 in. 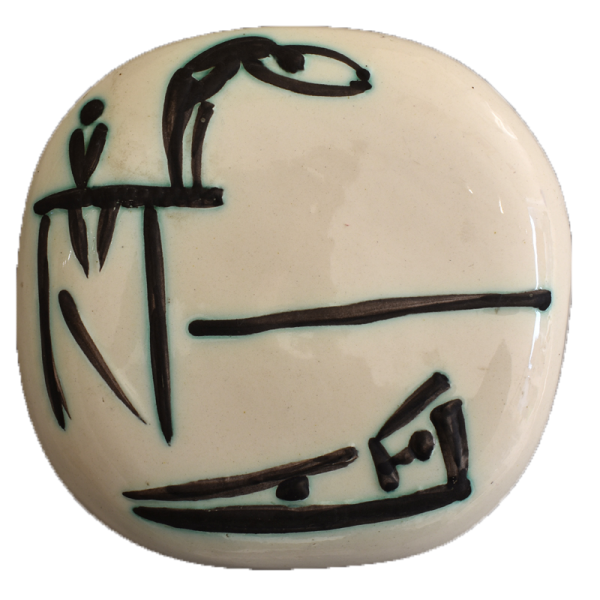 Additional Information: This original ceramic plaque was realised by the artist, Pablo Picasso. This work was conceived in 1956 and executed in an edition of 500. 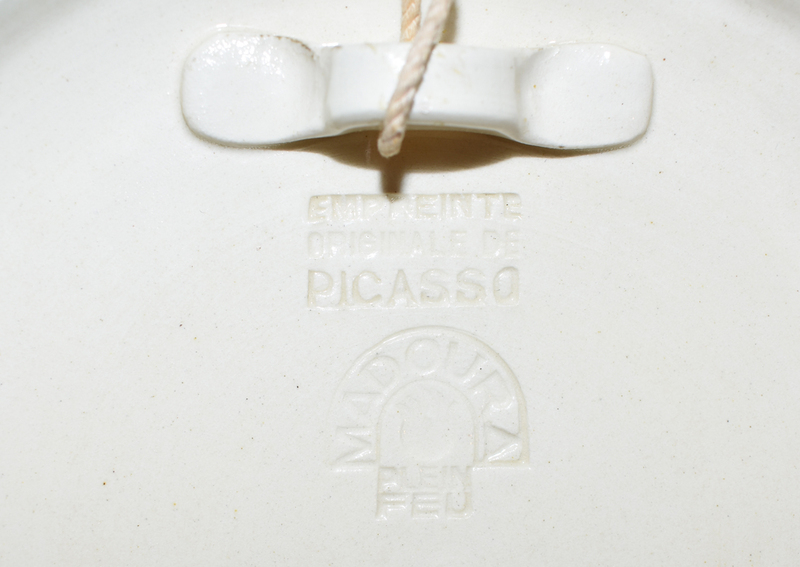 With the ‘Empreinte Originale de Picasso’ and ‘Madoura Plein Feu’ pottery stamps on the underside. Note: While in Golfe Juan in In 1946 Picasso decided, with his friend Louis Fort, to visit the pottery exhibition in Vallauris. He took a particular interest in the Madoura stand and asked to be introduced to the owners – Suzanne and Georges Ramié. They invited him to their Madoura Pottery workshop in Vallauris. There he made three pieces which he left to dry and bake. A year later Picasso returned to see how the pieces had turned out. He was delighted with the quality of the work and asked if he could make more. They agreed and an area of the workshop was arranged especially for him. Immediately, he began to work, inspired by his portfolio of sketches. So began a long and very productive partnership between Picasso and Madoura. The whole Madoura team became part of the creative process. They made sure Picasso had all the materials he needed and assisted in producing perfectly finished works of art. Suzanne Ramié shared her vast experience, teaching him all the secrets of ceramics. 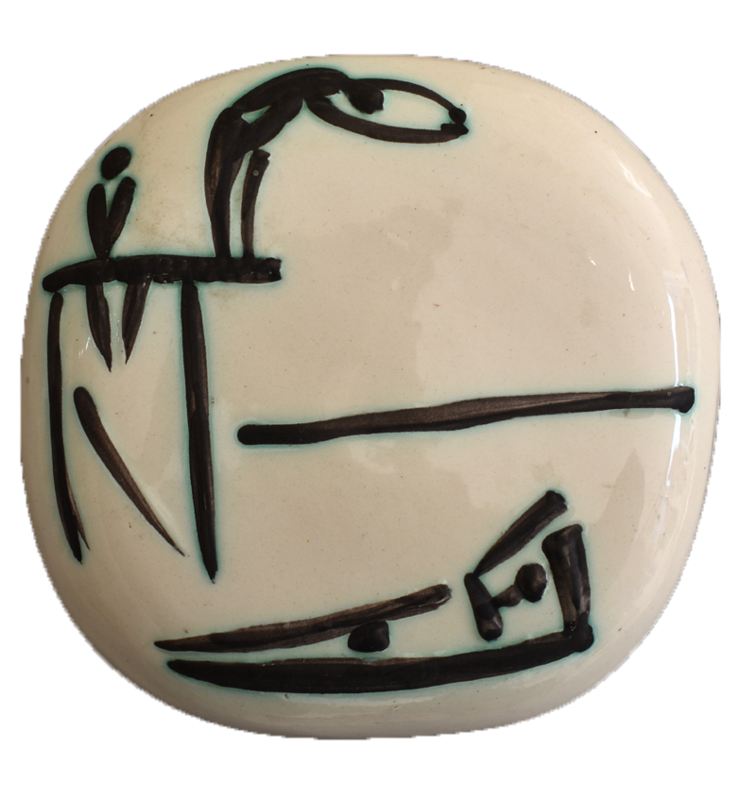 The ceramics ranged from vases, sculptures, plaques to even a complete dinner service. The familiar themes included bullfighting scenes, portraits and nature – goats, birds, and fish. In 24 years over 633 pieces were created in limited editions all engraved with the Madoura stamp. 2. Ramié, A. (1988). Picasso, Catalogue of the Edited Ceramic Works 1947-1971, Vallauris: Madoura. Condition: Excellent condition. 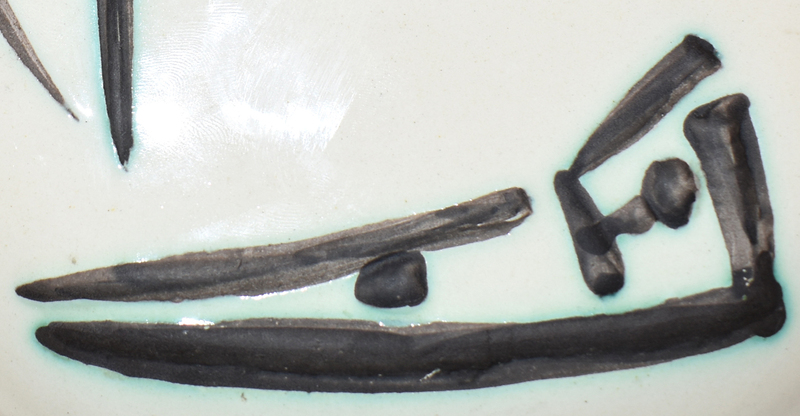 A very minor area of glaze removed on the inner rim of the plate, verso.